If you are looking for the perfect gift for the silver-haired women in your life, then look no further. White Hot is a capsule collection of haircare products specially formulated to brighten, cleanse, condition and add style and definition to white and grey hair. If she has shorter hair - think Glenn Close’s new pixie crop - then the White Hot Shoosh Quartet Bag (£45) is the one for her. It contains Brilliant Shampoo to give an occasional brightening boost, Glorious Shampoo for every day cleanse and shine and Luminous Conditioner for lustrous flex and bounce. In addition, Shooshing Crème is a styling product that gives shorter hair weightless volume, oomph and definition in a flash. If she’s kept her hair longer à la model Yasmina Rossi, then the White Hot Lifeshine Quartet Bag (£45) will keep her locks looking and feeling amazing. Containing: Brilliant Shampoo to give an occasional brightening boost, Glorious Shampoo for every day cleanse and shine and Luminous Conditioner for lustrous flex and bounce, the fourth product is Lifeshine Oil, a multi-purpose, light-weight oil to nourish, gloss and smooth. Maybe she is more of a ‘gronde’ - her hair is naturally white and grey but she still has some blonde left (or added in). Helen Mirren is a good example. Give her the gift of bright hair, without a shadow of any brassy or yellowing tones, with White Hot Intense Quartet Bag (£45) As with the other sets, it contains Brilliant Shampoo to give an occasional brightening boost, Glorious Shampoo for every day cleanse and shine and Luminous Conditioner for lustrous flex and bounce. The final product in the set is Intense Lustre Mask, a three-minute deep conditioning treat, with a gentle violet formulation to help banish yellow tones. 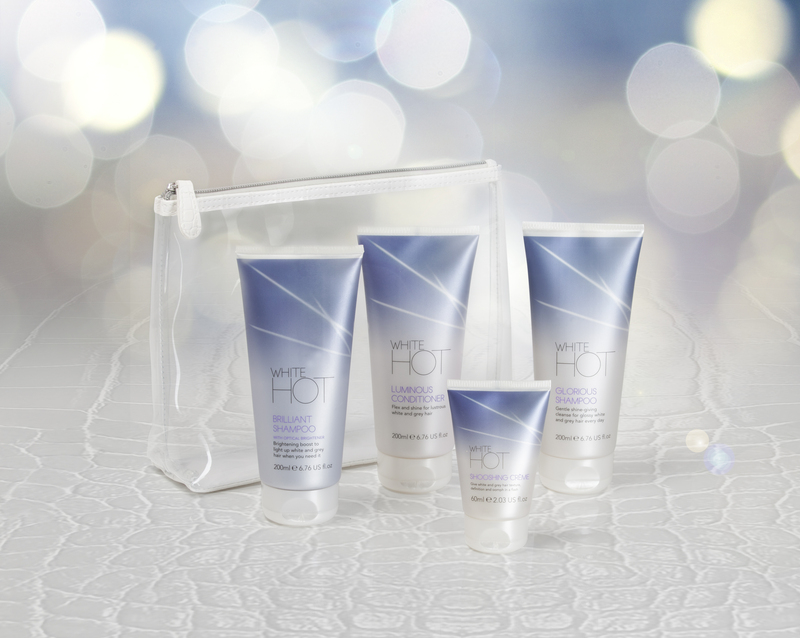 White Hot Quartet sets come in a clear, zippable bag with a stylish mock croc finish - handy for toiletries, whether at home or on the go. Please contact us via email at customercare@whitehothair.co.uk or via telephone at 0844 4633 978 to find out more. This press release was distributed by ResponseSource Press Release Wire on behalf of White Hot Products Ltd in the following categories: Women's Interest & Beauty, Retail & Fashion, for more information visit https://pressreleasewire.responsesource.com/about.